Type 2 diabetes mellitus (T2DM) is an independent risk factor for uric acid nephrolithiasis, and obesity augments this risk. We carried out this cross-sectional study on 25 patients of T2DM to assess the risk factors for uric acid nephrolithiasis and to assess their relation with components of the metabolic syndrome. A single 24-hour urine sample was analyzed for fasting urine pH, uric acid, creatinine and protein. Fasting serum sample was analyzed for HbA1c, glucose, creatinine, uric acid and lipid profile. Patients with past history of nephrolithiasis and significant hepatic or renal disease were excluded. The mean age of the participants was 51 ± 8.5 years and there were 16 females and nine males. Mean body mass index (BMI) was 27.3 ± 4.3 kg/m 2 and waist circumference was 90.8 ± 7.8 cm. Urinalysis revealed mean uric acid excretion of 595 ± 103 mg/24 hours and fasting urine pH of 5.6 ± 0.4. Fasting urine pH correlated inversely with the body weight, BMI and low density lipoprotein (LDL)-cholesterol (P < 0.05). Total volume showed inverse correlation with age and disease duration and correlated positively with body weight and BMI. Uric acid excretion did not correlate with the components of metabolic syndrome. Our preliminary data showed that low urine pH as the main risk factor for uric acid nephrolithiasis was consistently found in our study patients with T2DM. Higher BMI further accentuates this risk. Further data from more number of patients are necessary to confirm these findings. Limited data exist regarding the relationship between metabolic syndrome, type 2 diabetes and nephrolithiasis. , Previous studies have shown that obese and diabetic individuals have increased prevalence of uric acid stones in comparison to non-obese, non-diabetic subjects. 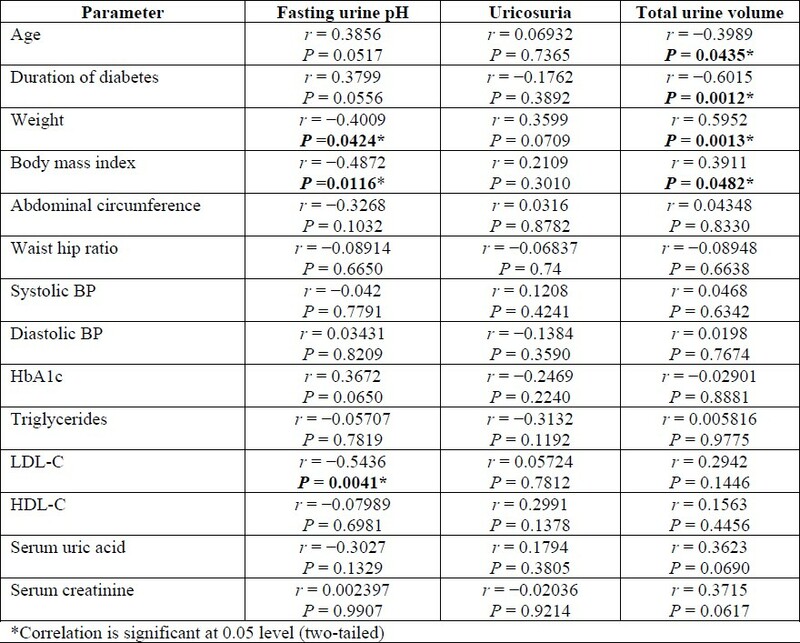 , The factors strongly associated with increased risk of uric acid nephrolithiasis are low urine pH, hyperuricosuria and decreased urine volume. Insulin resistance results in defective renal ammoniagenesis and low urine pH, thus contributing to uric acid nephrolithiasis. Most of the patients with idiopathic uric acid nephrolithiasis have low urine pH, which is a major lithogenic factor for formation of uric acid stones. We therefore carried out the 24-hour urine analysis in patients with type 2 diabetes to determine the risk factors that predispose them to uric acid stone formation. We also analyzed the association of these risk factors with the components of metabolic syndrome. Twenty-five patients of type 2 diabetes, with duration of disease more than one year, were enrolled in this cross-sectional study. Patients with past history of nephrolithiasis, significant hepatic/renal disease, pregnancy and chronic diarrhea were excluded from the study. Subjects taking any medications that influence uric acid excretion like allopurinol were excluded from the study. All the subjects consumed normal diabetic diet before sample collection. All participants gave informed consent to participate in the study and the study protocol was approved by the local hospital ethics committee. Body weight was measured with light clothing and without footwear to the nearest 0.1 kg. Standing height was measured using a wall-mounted stadiometer to the nearest 0.1 cm. Body mass index (BMI) was calculated as the weight in kilograms divided by square of the height in meters. Waist circumference was measured on bare skin as the narrowest circumference between the lower costal margin and the iliac crest in centimeters. The hip was measured at the maximum circumference at the level of the femoral trochanters. The metabolic syndrome was defined according to National Cholesterol Education Programme for Adult Treatment Panel (NCEP-ATP III) guidelines. Blood pressure was obtained from right arm, measured after a 30-minute resting period. A total of three readings, 30 minutes apart, were obtained from each patient and the average was taken for the study purpose. Fasting venous blood samples were collected between 0830 and 1000 hours, after an overnight fast of more than 12 hours, and were analyzed for glucose, uric acid and lipid profile. Fasting urine pH was measured with pH electrode on the first void urine sample at the start of 24-hour urine collection. A single 24-hour urine collection was done and analyzed on the same day for volume, uric acid, creatinine and protein. Urine pH was measured by pH electrode and urinary uric acid and creatinine by uricase and picric acid method, respectively. Serum glucose, total cholesterol (TC), high-density lipoprotein cholesterol (HDL-C) and triglycerides (TG) were analyzed using enzymatic method and low-density lipoprotein cholesterol (LDL-C) was calculated using the Friedwald equation for those specimens with TG less than 400 mg/dL. Data are presented as mean values ± Standard Deviation (SD) with total range of data. Relationships between continuous variables were assessed by Pearson's correlation and the distribution of all variables was considered to be derived from population following a Gaussian distribution. P values were reported for all statistical tests and a value <0.05 was considered to be significant. [Table 1] summarizes the demographic characteristics of the participants. Overall, the mean age of the study population was 51 ± 8.5 years and mean BMI was 27.3 ± 4.3 kg/m 2 . All the participants fulfilled the criteria for metabolic syndrome. The mean duration of the diabetes was 7.5 ± 4.2 years and duration of diabetes showed no relation with the risk factors of nephrolithiasis (P > 0.05). The results of the biochemical parameters and 24-hour urinalysis are given in [Table 2]. Fasting urine pH was significantly lower (5.6 ± 0.42) than seen in the general population and showed an inverse association with body weight [Figure 1], BMI and LDL-C. Mean urine volume was 2325 ± 701 mL/day and showed inverse correlation with age and disease duration [Figure 2] and positive correlation with body weight and BMI. Daily uric acid excretion was in the normal range and did not show any association with the components of metabolic syndrome. Body weight showed a linear relationship with serum uric acid and uricosuria (P = 0.0709). [Table 3] summarizes the results of correlation analysis between clinical, biochemical and urinary parameters of the patients. Table 1: Clinical characteristics of patients. Table 2: Biochemical parameters and 24-hour urinalysis report of patients. Table 3: Correlation between clinical, biochemical and urinary parameters. 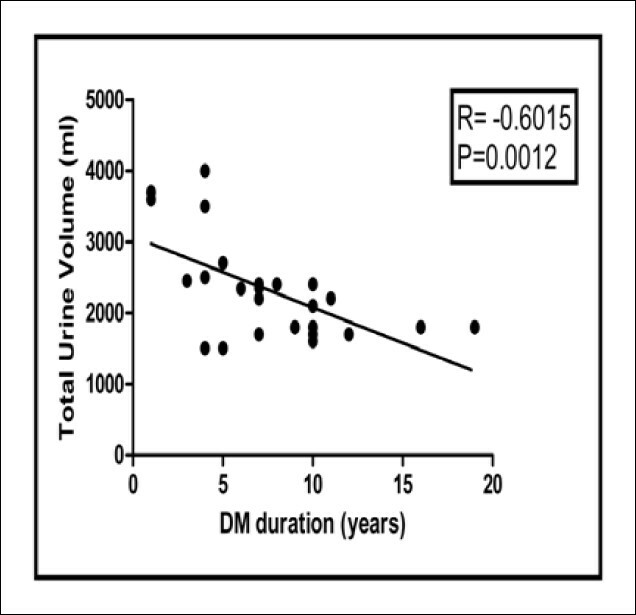 Figure 2: Total urine volume relation with duration of diabetes. In this study, we analyzed the urinary characteristics of Type 2 diabetes mellitus (T2DM) patients who did not have past history of nephrolithiasis. Our data show that T2DM patients have low urine pH (5.6 ± 0.42), with normal uric acid excretion and total urine volume. Uric acid crystallizes at a concentration of more than 200 mg/L in the presence of acidic pH, leading to stone formation. We identified low urine pH in our population as a significant risk factor for uric acid nephrolithiasis in T2-DM patients. Cameron et al showed that fasting urine pH was similarly low in patients with diabetes in comparison to normal volunteers. Increase in body weight was inversely associated with urinary pH in our data [Figure 1], and previous studies demonstrated that body weight and metabolic syndrome play a significant role leading to hyper-uricosuria and low urine pH. Fasting urine pH showed a negative association with LDL-C but not with any components of the metabolic syndrome. The metabolic syndrome with associated insulin resistance constitutes another important risk factor for the uric acid nephrolithiasis. ,, In our data, individual components of the metabolic syndrome did not show any correlation with the urinary risk factors. 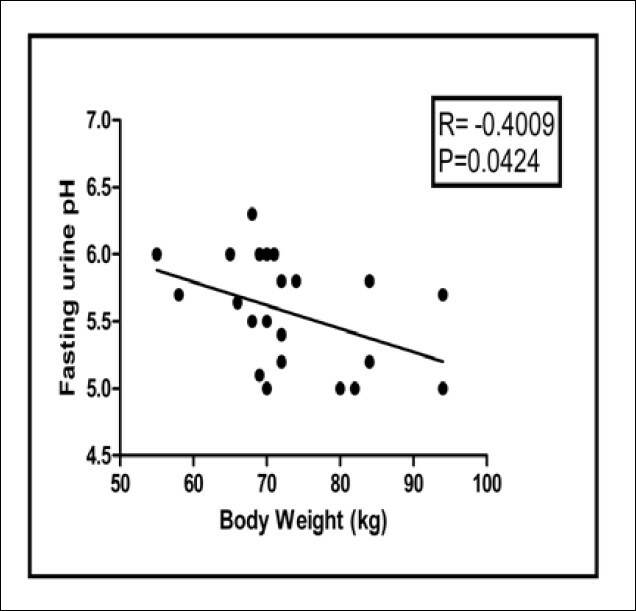 Body weight and BMI showed a significant effect on fasting urine pH and urine volume. The limitations of our study are small sample size, lack of data from normal controls for comparison and not measuring the ammonium and net acid excretion in the urinalysis. Also, we did not control the dietary intake to minimize its effect on hyperuricosuria in the study participants. To conclude, our data shows that low urine pH as the main risk factor for uric acid nephrolithiasis which was consistently found in our study patients with T2DM. Obesity further augments this risk. This predisposition to uric acid nephrolithiasis in patients of T2DM highlights the need for effective screening strategies. Further longitudinal and cross-sectional studies with larger numbers of patients are required to confirm the association between diabetes and uric acid nephrolithiasis. 1. Mokdad AH, Ford ES, Bowman BA, et al. Prevalence of obesity, diabetes, and obesity related health risk factors. JAMA 2003;289:76-9. 2. Lann D, LeRoith D. Insulin resistance as the underlying cause for metabolic syndrome. Med Clin North Am 2007;91(6):1063-77. 3. Khashab MA, Liangpunsakul S, Chalasani N. Nonalcoholic fatty liver disease as a component of the metabolic syndrome. Curr Gastroenterol Rep 2008;10(1):73-80. 4. Vignesh JP, Mohan V. Polycystic ovary syndrome: a component of metabolic syndrome? J Postgrad Med 2007;53(2):128-34. 5. Sakhaee K, Maalouf NM. Metabolic syndrome and uric acid nephrolithiasis. Semin Nephrol 2008;28(2):174-80. 6. Taylor EN, Stampfer MJ, Curhan GC. Obesity, weight gain, and the risk of kidney stones. JAMA 2005;293:455-62. 7. Lieske JC, de la Vega LS, Gettman MT, et al. Diabetes mellitus and the risk of urinary tract stones: a population-based case-control study. Am J Kidney Dis 2006;48(6):897-904. 8. Daudon M, Jungers P. Diabetes and nephrolithiasis. Curr Diab Rep 2007;7(6):443-8. 9. Pak CY, Sakhaee K, Moe O, et al. Biochemical profile of stone-forming patients with diabetes mellitus. Urology 2003;61:523-7. 10. Meydan N, Barutca S, Caliskan S, Camsqari T. Urinary stone disease in diabetes mellitus. Scand J Urol Nephrol 2003;37:64-70. 11. Daudon M, Lacour B, Jungers P: High prevalence of uric acid calculi in diabetic stone formers. Nephrol Dial Transplant 2005;20:468-9. 12. Ngo TC, Assimos DG. Uric acid nephrolithiasis: recent progress and future directions. Rev Urol 2007;9(1):17-27. 13. Abate N, Chandalia M, Cabo-Chan A Jr, Moe OW, Sakhaee K. The metabolic syndrome and uric acid nephrolithiasis: Novel features of renal manifestation of insulin resistance. Kidney Int 2004;65:386-92. 14. Expert Panel on Detection, Evaluation, and Treatment of High Blood Cholesterol In Adults 2001. Executive Summary of The Third Report of The National Cholesterol Education Program (NCEP) Expert Panel on Detection, Evaluation, And Treatment of High Blood Cholesterol In Adults (Adult Treatment Panel III). JAMA 2001;285:2486-97. 15. Finlayson B, Smith LH. Stability of the first dissociable proton of uric acid. J Chem Eng Data 1974;19:94-7. 16. Cameron MA, Maalouf NM, Huet BA, Moe OW, Sakhaee K. Urine Composition in Type 2 Diabetes: Predisposition to Uric Acid Nephrolithiasis. J Am Soc Nephrol 2006;17:1422-8. 17. Daudon M, Lacour B, Jungers P. Influence of body size on urinary stone composition in men and women. Urol Res 2006;34(3):193-9. 18. Robertson WG. Renal stones in the tropics. Semin Nephrol 2003;23:77-87. 19. Maalouf N, Cameron MA, Moe OW, et al. Novel insights into the pathogenesis of uric acid nephrolithiasis. Curr Opin Nephrol Hypertens 2004;13:181-9. 20. Daudon M, Traxer O, Conort P, Lacour B, Jungers P. Type 2 Diabetes Increases the Risk for Uric Acid Stones. J Am Soc Nephrol 2006; 17:2026-33.